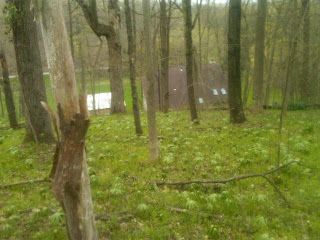 I walked for 1 1/2 hours deep into our woods this evening searching for mushrooms while my hubby mowed. I watched in front of each foot as I walked after pausing to scan ahead of me before I stepped forward, looking for likely places for mushrooms. I found instead abundant sign of many, many deer - ground hog holes so huge and deep I was terrified they would jump out at me! So I stomped hard and carried a stick. It began to rain steady so I stopped and turned my face up - I love being out in the rain and it has been a long time since I've walked in it. Focus - face down - searching. I found the most brilliant bright red mushrooms I have ever seen - more like wide flat toad stools and many little round poisonous ones. My husband tried to make me feel better reminding me we live in the coldest place in Ohio and saying it's just too early for mushrooms in our neck of the woods (no pun intended). He lied. But I appreciated the attempt. All in all it was an exhilarating walk, quiet time, very different than my days have been recently. I will be buying mushrooms tomorrow.